SJKBFC is a Catch, Measure, Photograph, and Immediately Release Organization. 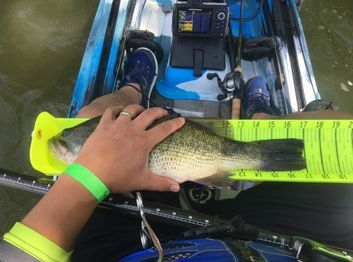 Only black bass, including Largemouth and Smallmouth Bass, are eligible for scoring. No tournament participant will keep any Bass caught for any reason. 1. Present a valid fishing license in the state of the tournament. 2. Present completed Waiver of Liability Form or has completed the annual waiver form. 4. Present digital camera or cell phone. 5. Present PFD, any angler that does not have PFD will not be able to compete in that event. 6. Present Hawg Trough for inspection. Only a standardized measuring device (Hawg Trough) or similar product will be acceptable at the Tournament Director’s discretion. 7. Receive the tournament’s identifier. This identifier MUST be present in all pictures of tournament fish. Any fish checked in at the end of tournament that does not have the identifier in the picture will have that fish disqualified. Each tournament competitor will measure each fish as caught. The angler will take a picture of the catch, from above the fish center, see web site SJKBFC.COM, pictures that clearly demonstrate the position of the entire fish on the device. Fish will immediately be released. Pictures should be shot at high resolution to enable judges to zoom in for detailed analysis. Photos that do not clearly show the proper positioning of the fish on the Trough, and the clear length of the fish measurement, will not be considered valid and will be excluded. Multiple pictures of a single fish must be deleted immediately. Multiple pictures of the same fish presented at check in will result in disqualification of participant and possible club sanctions. Each event will have a specific format, launch time, and finish time, designated launch site, and fishing boundaries. Scoring will be done by the assigned tournament directors. Tournament Directors decisions concerning scoring and protests of any kind will be final. No angler can be on any type vessel on the designated water until the start of the event. No angler can throw any can of line, trap or any other device in the water from boat or shore into designated water until the start of the event. Anglers may travel to the body of water to walk around and check out the location of the event during the “Off Limits” period. Any accusation of violations of any of the tournament rules must be levied immediately at the scheduled end of the tournament time to have an effect on the outcome of that tournament’s standings. Violations of any rules may result in disqualification. Any protests involved with any tournament procedures or outcomes must be filed immediately upon occurring, or upon discovery. Any participant found guilty of cheating in a tournament will be disqualified from that tournament, forfeit any and all prizes +/or prize money from that tournament, and, if a member of the Club, be subject to any further actions as deemed appropriate by the Executive Committee. Unintentional infractions of the rules will be decided on a case by case basis by the members of the executive committee. Winner of the tournament will be the angler with the largest total length of his longest five (5) fish. In the event of a tie, the angler with the longest single fish will be the winner. If there is still a tie the judging will proceed to the second longest fish, third longest fish, etc. An additional end of the season tournament, the “SJKBFC CLASSIC” will be scheduled annually. See by laws for eligibility. The winner of this tournament will earn an award separate from any other club award. The results of this “CLASSIC” will not apply towards any other annual club awards. Tournament winners will receive the appropriate prize for that tournament. Total prize money for each tournament’s winner’s will be 50% of that tournament’s regular entry fees collected. Payout is always 3 places paid regardless of # of entrants and 50/30/20 split. In addition, 25% of each tournament’s regular entry fees collected will be paid out as a “Lunker” prize to the competitor with the largest single qualifying bass. If there is no winner – “if no qualifying fish are caught in a tournament 100% of entry fees go to the Club". There is no lunker awarded. If there is one (1) winner, it’s a winner takes all of the eligible winnings. If there is a first and second place, third place winnings are split 50/50 with first place winner and second place winner. Payouts will be presented to the winners at the end of the tournaments. All tournament participants are eligible to compete for prizes for that tournament. Only SJKBFC members will accumulate points toward the annual club awards . Guests may only fish any tournament designated as “Guest Invitational or Open” . Guests will earn winning tournament proceeds the same as members. Anglers, including Guests, are responsible for understanding the tournament rules and point structure. It is the responsibility of ALL participants to read, understand, and abide by all Tournament rules and the Angler of the Year rules. All anglers participate at their own risk. Tournament officials, club members, volunteers, sponsors, individuals and any others directly or indirectly involved in this or any other SJKBFC organized tournament or event, are exempt from liability from loss, damage, injury, negligence, or harm to any entrant, their companions or other participants, their vessels, equipment, supplies, or any other personal property, whether on the water or land.. Observe safe boating measures at all times. Every angler is expected to follow all U.S. Coast Guard regulations. SJKBFC mandates that a U.S. Coast Guard approved PFD is to be worn at all times while on the water. Any angler not wearing a PFD during a SJKBFC tournament will be disqualified from the competition. The use of cell phones is allowed. Tournament participants arriving late will be permitted to fish, providing all pre-tournament requirements have been completed beforehand. Late arrivals must find and report to a Tournament Director to properly check in. No fishing is allowed before checking in with a Tournament Director. After 5 minutes late total catch is disqualified, including lunker competition. In addition, any competitor that has a line in the water at any time after the official end time of the tournament will have his entire catch immediately disqualified in total. A participant leaving the tournament site for any reason prior to the end time must first notify another participating vessel. Leave his or her camera, with fish caught, with a participating member to be reviewed by tournament directors at end of tournament. Once a vessel has left the water during a tournament it may not re-enter the water. The vessel is out of the water if it is on the trailer, car-topped, or loaded into or on a truck or any vehicle. Anglers drifting and fishing must give right of way to anchored vessels. All fish must be caught via hook and line. Only one line may in the water at any time. Line must be hand controlled (No trolling allowed) the number of hooks allowed and fishing rigs or lures will be governed by the State of New Jersey rules. .
Only artificial baits and lures are permissible. Pork rind baits are permitted. No live bait of any kind permitted. Anglers may not put lines in the water prior to launching at the scheduled start time on the day of a tournament. Fish attractants applied to artificial baits is permissible. No craft except kayaks or canoes, without any means of propulsion except paddling, or pedaling, if the craft is thus equipped, will be allowed. Only one person per vessel is permissible. All vessels must comply with all State and Federal operation and safety laws and regulations. All anglers must comply with all existing State and Federal Fish and Game laws and regulations. All angling must be done from the vessel. No participant is allowed to leave his/her craft in order to land a fish, whether it be into the water or on to land. No fishing while standing (except in the vessel) or wading is allowed. If any tournament site has to be changed due to uncontrollable circumstances, alternate site locations might be set as needed by the Tournament Director(s). Start and end times are also subject to change at the discretion of the Tournament director(s). Anyone wishing to continue fishing after the tournament ends will first notify the Tournament Director, so we do not have to search for you later.